Some weeks ago Pruned discovered Chicago's North Avenue Beach — and its tideless, shimmering blue-green waters; its unsalted offshore breezes; nearby multi-billion dollar seawalls as sculpted by the Army Corps of Engineers; the immigrant lakefill; and Lake Michigan's low E. coli count. Clearly there were just too much to keep us entrenched along the shoreline and away from our blog. 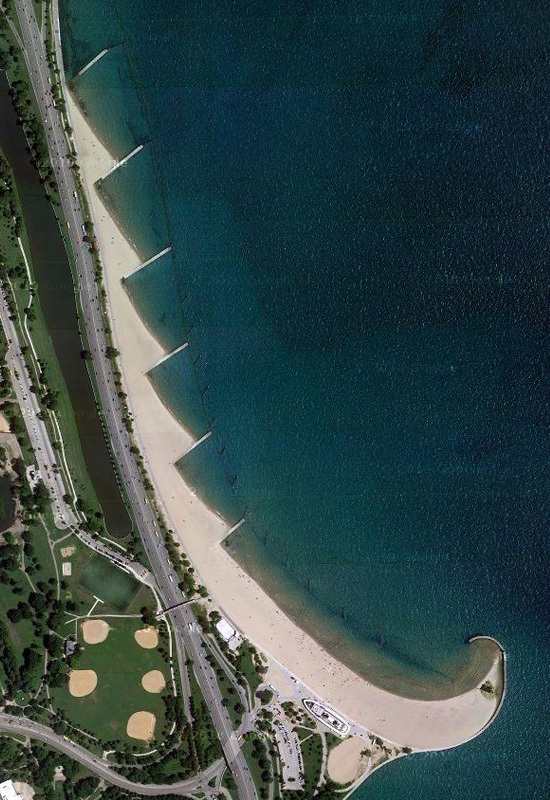 But we simply have to come back and share with our readers this satellite image of the groynes seemingly jutting out like spinal projections from Lake Shore Drive to keep the relentlessly drifting sand at bay. These are the self-replicating, self-similar geology of the city's mercurial edge. Groynes, or groins, are built to control and modify beach erosion. Usually constructed perpendicular to the shoreline and with timber pilings, steel sheet pilings, concrete and/or rock barriers, they act as dams to block the flow of sediment. Unfortunately, this also reduces sand replenishment on the downdrift side, necessitating the construction of another groyne. And then another and then another and then another, conceivably down the entire stretch of coast, domino-like. Which really makes us wonder what monumental earthen hydrotactics will be devised to fight off the coming post-glacial Flood. And whether they'll set up the opening scenes for La Jetée II.